Church website success is not based on the platform, the tools, the colors, or even the plugins! It’s about the strategy behind your website. In this episode, Dave and Justin share 5 Best Practices to get your website working for you. Your church is uniquely equipped to minister and disciple certain people. For example, if you don’t have a Korean service, you wouldn’t spend energy and effort in trying to get Korean speaking people to your church, right? That’s an extreme example, but you should start thinking about who you are able to reach, and focus on those people on your website. So if you are equipped to serve families, show that on your website. If you are NOT equipped to serve families like if you don’t have a nursery, don’t include that information on your website. There’s nothing worse than someone being misled by a website. If you say on your website you’re a church for families, but when a visitor arrives and there’s no place for their 4-year-old, you’ve done some damage. Does this mean you’re leaving people out? Nope! McDonald’s and Taco Bell are great examples of focusing your marketing and website efforts to a particular person without leaving others in the dust. McDonald’s started as a family company, aiming to make mom’s life easier by providing dinner to go. Those roots still live on in McDonald’s branding today. They have Play Places for families to bring their kids, happy meals and big kids meals, and the Ronald McDonald House charity. Taco Bell, on the other hand, focuses their website and marketing on the younger generation. Their brand is about living more, inexpensive food, and fun with friends. So does that mean a single college student can’t eat at McDonald’s, or that grandpa can’t eat at Taco Bell? Not at all! So don’t feel like you’re leaving groups of people out when you focus your church website on one type of person. So really dial in who you want to reach, and make sure that your website speaks directly to them. Gathering your visitor’s information is critical to start communication and build relationships. We don’t shy away from asking for people to fill out connect cards, so why not guide people to provide their information on your website? But don’t stop there. Think about the second action you want your visitors to take. What should they do after they watch a sermon? Include next steps on those pages as well. Your visitor journeys on your website should end with a way to contact you. Simply put, a lead magnet is a free resource you give away to your website visitors. This is a simple way to provide value for your visitors while also collecting their email so you can deliver it to them. But why would you want to invest your resources into collecting a simple email? You no longer have to rely on a hope and a prayer that your website visitors will come to your church. Now we can be proactive and learn who our visitors are and start the relationship before they even visit in person. So often we see pictures of church buildings on websites…but is that really all you want people to know about your church…that it’s just a building? Your church is more than a building…so show it on your website. It’s kinda like if you drove past a beautiful restaurant with amazing bricking…is that enough to take you inside the restaurant? Or would you instead take our your phone, Google the website, read reviews, and see what food is inside? And what a terrible experience it would be if instead of their food you just saw more pictures of their building! Show what kind of people are at your church and back up your claims. If you say you’re a church that welcomes all people, include all types of people on your church website. And use pictures of your actual church members. Don’t rely on stock photos for your church. Every page should include pictures (yes, even your contact page). Pictures of your people and your church culture are the priority. Even if you’re a church in a temporary building or that meets in a gym you can still highlight your people by just taking family portraits at the park or your folks grabbing a coffee – props to Brandon Swain from For Ministry Resources for this tip. Your church website should become an archive of information to answer people’s questions. 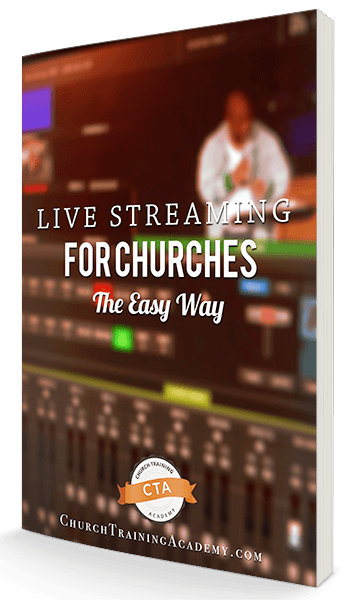 Your congregation should know that they can reliably find answers to their questions online. And over time your community and even the world can find their answers on your website too. If you believe that in the rapture Christians will be pulled from Earth, what is left for the 144,000 and the world to learn about Jesus? Your preaching is gone, your groups are gone, but your website will remain. The church is no longer just an event on Sunday mornings. Ministry goes on throughout the week both in the real world and the digital world. People can now go online and learn about Christ while you sleep at night. So if you really want people to grow in their walk and hear the Gospel, it’s time to turn your church website into a resource for your congregation and the world to find answers. A successful church website goes beyond the platform and colors. Your website’s impact is determined by the strategy behind it. Craft a website that speaks to the right people you’re equipped to serve. And give them a path to follow so you’re not just hoping they come. When you provide a free resource of value for your visitors you make a positive first impression, which you can then nurture to get them to visit in person. And to help your potential visitors feel at ease, show your church life on your website. Prove that you’re not just a building. You’re a community of real people with answers to life’s deepest questions, so put it on display for all to see with your website. Have you already implemented these best practices? Which one are you doing to try first? Let us know in the comments below!